WEST LAFAYETTE, Ind. — Purdue senior Brianna Neumann was named the Big Ten Women’s Field Athlete of the Week on Monday in the wake of her standout performance at the Notre Dame Meyo Invitational this past weekend. She won the women’s pole vault on Saturday, clearing a personal record for the third consecutive meet and topping several of the nation’s best vaulters. Purdue University's Brianna Neumann currently ranks 12th in the country in the women's pole vault with her top mark of 4.21 meters (13-09.75). Going head-to-head with national leader Alicia Rue of Minnesota, two-time NCAA All-American Vera Neuenswander of Indiana and 2009 NCAA Outdoor All-American Mary Saxer of Notre Dame, Neumann came out on top, clearing 4.21 meters (13-09.75) and setting a new event and Meyo Track record. Neuenswander led early, clearing 4.00 meters (13-01.50) on her first attempt, but was overtaken by Rue and Saxer at 4.15 meters (13-07.25) as they both sailed over on their first tries at the new height. Neumann took the lead for good at the final height, clearing on her third and final try and securing the No. 12 mark in the nation this season. Her new personal record is good for the second-best indoor mark in Purdue’s history and remains just four centimeters (1.5″) shy of the Boilermakers’ indoor record and the automatic qualification standard for the 2010 NCAA Indoor Championships. 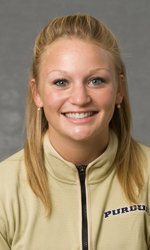 Former Purdue standout Ebbie Metzinger currently holds the school record, clearing 4.25 meters (13-11.25) on Feb. 2, 2002, at the Scarlet and Gray Invitational hosted by Ohio State University. Neumann is the first female Boilermaker to earn Big Ten Athlete of the Week since Kara Patterson earned outdoor weekly honors on April 29, 2009, and Neumann claims the first indoor conference award since she shared recognition on Feb. 26, 2008. Neumann and her Boilermaker teammates return to action this Friday and Saturday at the Grand Valley State Invitational.